Underneath our skin all people are the same — unless, that is, you have tentacles instead of legs, a fishtail where your waist ends, or a long, elegant beak springing from your face. Artist Benedetta Bonichi creates a variety of X-ray art, combining human and animal bodies, glassware, and jewelry to form unique images. 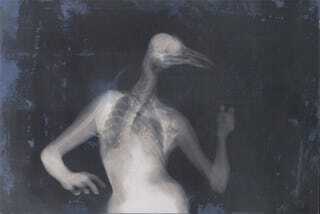 A few of her medical-inspired masterpieces go the cryptid route, resulting in bony images of human-animal hybrids.